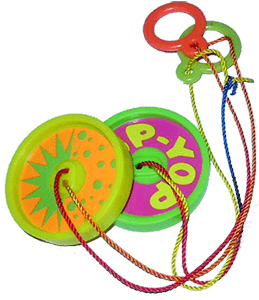 For a period of 1968, the Op-Yop was the favorite toy across the United States. Made of two plastic, multicolored discs with a string running through and between them. When the string was pulled together, the discs moved apart and then clapped together with a loud noise. Manufactured by Kramer Designs, more than two million units of the toy sold before they faded into fad oblivion.